Kazuri Beads and pottery Centre produce brightly-colored, handmade ceramic jewellery which are sold all over the world. Kazuri Beads supports literally hundreds of disadvantaged Kenyan women, by providing employment and healthcare services for them and their families. 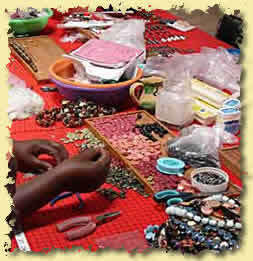 A visit to the Kazuri Beads workshop and craft centre takes approximately one hour and here you will see the various processes. A knowledgeable guide will show you around where you will see the whole process from the molding of raw clay through to the glazing, decorating and threading of beads as finished products. The salesroom is attractively laid out and a beautiful place to visit. The company was originally founded by the late Lady Susan Wood in 1975, who created employment for struggling single mothers in the locality. Kazuri is still located in its original setting in Karen, and the workshop there now has over 340 local women who are employed, most of them still being single mothers. It's good to know that each piece of jewellery sold from the Kazuri Beads store is in some way helping people who really need it. The Kazuri workshop in Karen is equipped with a clinic, which provides free medical care for the employees. 80% of the medical bills outside the Factory Clinic are also absorbed by Kazuri. In their mission statement Kazuri say that "the greatest contribution we can make is to create employment, especially for the disadvantaged and this remains our guiding philosophy. The result is reflected in the strength of the Kazuri Family and the beauty of our products." Kazuri have outlets at various places around Nairobi and a worldwide distribution network. They are a fair trade company and you can buy their jewellery online. In addition to the main sales room and workshop in Karen, retail stores selling Kazuri beads in Nairobi are found in the Westgate Shopping Centre, Viking House (by Westlands roundabout), The Junction Shopping Centre and Capital Centre. *Visit Kazuri beads factory and pottery centre, Karen blixen and the giraffe centre tour in Langata, Karen, Nairobi.